Bot Thoughts: AVC: Is a Compass Necessary? While building my 2012 AVC entry, basic questions keep coming up. What sensors are really needed to reliably run around the course? Do we really need a compass? A very sharp fellow I know, Jesse, asked me this recently. I had no answer. Looking at 2011 top finishers, 3rd place Team XYZZY used an ArduPilot board to create a tilt-compensated compass, adding GPS, and a wheel encoder. The 2nd place finisher, Team Minuteman, ran only a gyro and wheel encoders using a record-playback approach. Team Tobor placed 1st for the second year in a row using fairly sophisticated mathematics to fuse data from a 1-axis gyro, 2-axis compass (effectively), encoders, and a GPS. 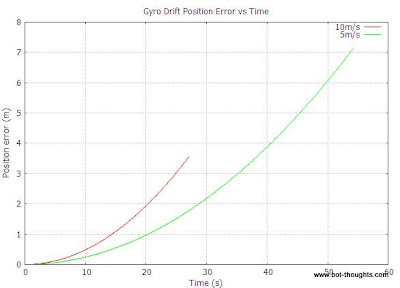 MEMS gyros suffer from drift which can be minimized, per the datasheet, to 200°/hour using their 3-point calibration technique. That works out to 0.0556°/second. The course is about 270m long and at last year's speeds of about 5m/s, it takes approximately 60 seconds to complete. Now define positions, x, along the course (I'm assuming a straight course for simplicity) with a step of dx meters. Then define time values given the position values. Wrap all that in a function, and plot the results. For a speed of 5m/s, we get a total position error of just over 7m by the race's end. But, if you want to win the AVC in 2012 you sure as heck better be going faster than 5m/s. Let's say the speed-doubling trend continues and you run 10m/s. By the end, position error is 3.6m. This is the same amount of error you can expect from your GPS, best case scenario. If the robot goes faster, cumulative position error reduces, all else being equal. You can probably find MEMS gyros with better drift performance; the ADXRS610 is obsolete. One could calculate heading from wheel encoders to improve heading estimates. 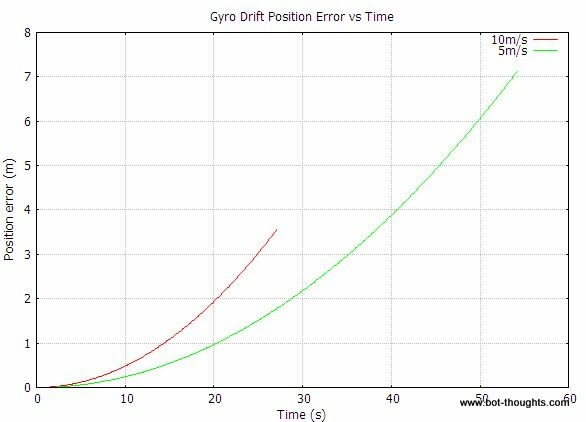 Turns may have some residual effect on gyro readings after returning to a straight course. I haven't tested this myself. Compasses are not perfect, suffering from possible soft-iron distortion, poor heading accuracy (1-2 ° is typical), external interference, etc. Some time ago, I made a design decision without really running the numbers. It's much better to analyze first, then decide. The lesson pulled from the AVCs so far is twofold: One, Don't rely on GPS. Two, whatever position system you rely on most has to really work. It has to be calibrated, compensated if possible, etc. Other than that, the finish order last year was, in my opinion, largely due to luck. Scott's robot, Tobor was 'luckier' in that it was a more consistent finisher overall, which statistically improved it's chance of going through the hoop on a faster run. This year, you must go fairly fast (20 MPH or so I think will be sufficient) and you need to have a good chance of going through the hoop each run. That means you need a reliable robot that can consistently complete the course and actively tries to go under the hoop each time. This is an interesting question and a good analysis. You took the relative error of the gyro and accumulated the error of the calculated absolute position. My intuition suggests that the circuitous nature of the AVC course will assist in a magnetic compass's absolute error being minimized. Restated: the sum of the error of an absolution heading approaches zero as the vehicle's heading is integrated about 360-degrees during the course of the event. Because a gyro's error is relative, I do not believe it will benefit from the course being a complete circuit. Conversely, if the course were not a circuit, the magnetic compass would not have the advantage.